Headquartered in Goshen, Indiana, Noble Composites was the premier designer and manufacturer of side walls for the Recreational vehicle industry. The Company manufactures all of its products in Elkhart and sells directly to OEM’s. Noble was experiencing strong growth and was contemplating the sale of the company. Crane Co is a global diversified manufacturer for a variety of products. Crane Co is headquartered in Stamford, Connecticut and had initiated contact with Noble regarding the possibility of a transaction. The ownership group was mainly over sixty years of age. Although the next level of management was strong, the owners sought to maximize value and achieve liquidity and wealth diversification. The Company operated in a very competitive and highly cyclical marketplace. There was a new well funded entrant in the marketplace adding uncertainty to the outlook for revenues and margins. Legacy ran a highly confidential targeted process that attracted numerous potential acquirers. 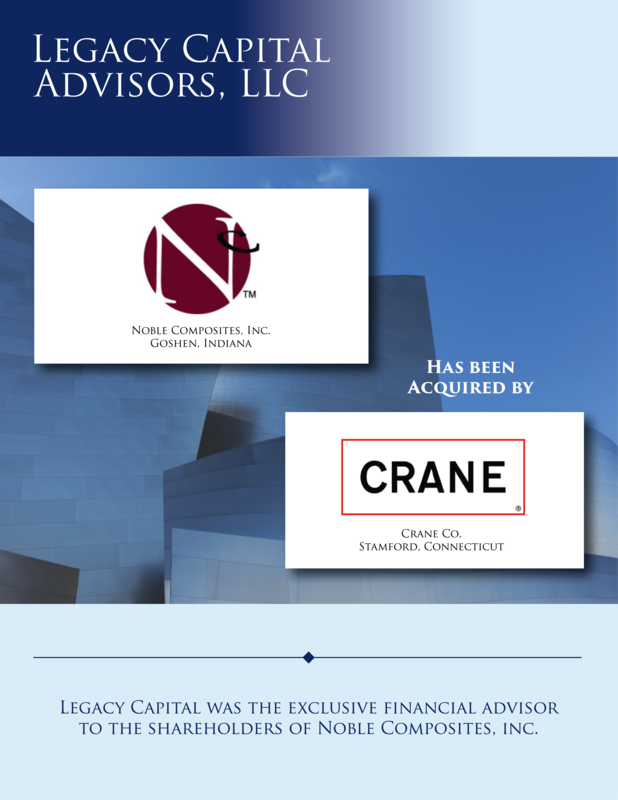 As a result, Legacy was able to increase the initial offer price from Crane by approximately 50%. Legacy negotiated strong employment agreements for family members continuing with the business.